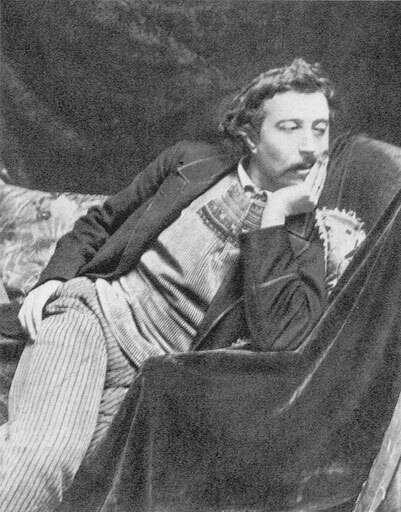 Artist Eugène Henri Paul Gauguin was a self-described “barbarian,” a tortured and gifted soul who was never able to settle into the life that 19th century Parisian society expected of him. At the age of 35 he left a career as a stock broker to pursue his passion, painting. He consequentially suffered periods of poverty and family discord, yet his fateful choice resulted in some of the most influential paintings of all time. Throughout his artistic journey, he was continually pulled towards a more primitive lifestyle. Ever wandering, he traveled across the world in search of artistic inspiration. As a food writer, I am always interested in the foods that fueled gifted artists like Gauguin; cooking a meal inspired by the man allows us a more visceral way to meditate on his life and work. Gauguin painted images of food throughout his life, and he dreamed of living in a tropical paradise where he could “live on fish and fruit.” Gauguin’s wanderlust eventually led him to exotic locations where he enjoyed simple, local tribal foods, as evidenced by his journal entries. Gauguin was born in Paris on June 7, 1848 to a radical journalist and his wife, the daughter of a prominent socialist writer. Revolution was in the air, and Gauguin’s parents were outspoken about their beliefs. By the end of his birth year, conservatism prevailed in France. Out of concern for their own safety under this new government, Gauguin’s family fled to Peru. His father suffered a fatal heart attack during the journey, leaving young Gauguin with his mother and sister. They settled in Peru, and Gauguin cherished his boyhood in this exotic landscape. Many believe that the imagery and colors of this Peruvian childhood were a major influence on Gauguin’s painting style. 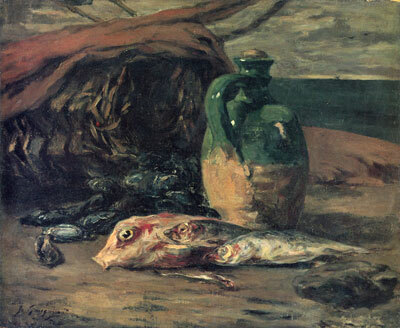 Gauguin – Nature morte aux poissons (c. 1876-1878). Source: Wikimedia Commons. 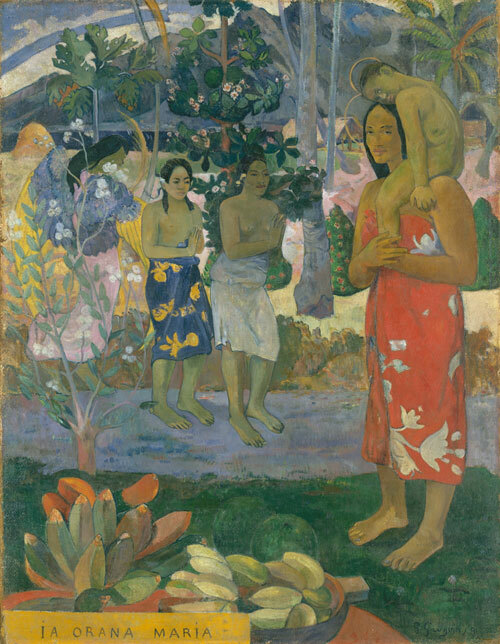 At the age of 7 Gauguin returned with his family to France, where he attended school. He much preferred life in Peru to his school years in France, and at age 17 he enlisted as a merchant marine. It is perhaps the earliest example of his rebellious nature. Throughout his life, Gauguin deviated from the paths that would lead to financial security. 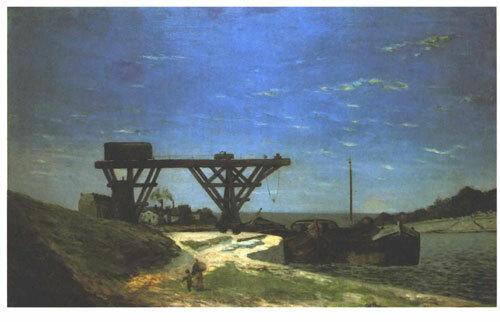 His constant desire for adventure, which he referred to as his “terrible itching for the unknown,” left him with a fondness for the lifestyle of what he referred to as “savages.” Most art historians agree that when Gauguin used this term he meant “primitive,” or a rejection of the bourgeois values that he’d witnessed while living in Paris. In 1873 Gauguin married a Danish woman by the name of Mette-Sophie Gad. 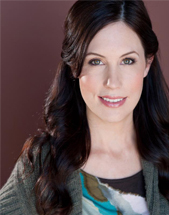 Together they had five children and he supported his family as a successful stockbroker. During this time his attraction to the art world grew. He began making purchases for his personal art collection, and he took up the hobby of painting. When the stock market crashed he made the decision to pursue his artistic passion full time. As a painter his personal fortune quickly dwindled. He was forced to work as a tarpaulin salesman for a brief time, moving to Copenhagen with his wife and her family to make ends meet. Eventually Gauguin returned to Paris with his son, who was ill. He worked as a bill poster to pay for his son’s care, while simultaneously pursuing his painting career. His wife became frustrated with their constant financial instability; she eventually left him in 1894. 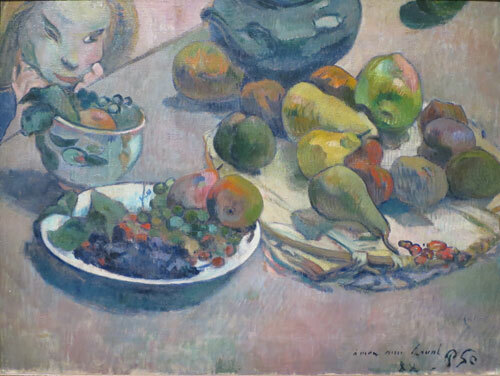 Gauguin – Nature morte aux fruits (dédicacée à Laval). Source: Wikimedia Commons. Gauguin’s mentor Camille Pissarro spotted his talent early on and invited him to exhibit with the up-and-coming Impressionists of the time, including Monet and Degas. Though his initial schooling was in Impressionism he connected deeply with the Symbolist style, as it gave him an opportunity to paint more than just a literal reflection of what he saw. Starting in 1886 he made the first of many trips to an artist’s colony in Pont-Aven, Brittany, where his use of color and symbols more firmly solidified his role as a pioneer of the Symbolist movement. Fellow artist Emile Bernard, who also painted at Pont-Aven, described their work as a style wherein “ideas dominate technique.” In 1887 Gauguin traveled further in search of inspiration, landing first in Panama, then Martinique. There he experimented with using analogous colors and non-representational color in his work, further breaking from a realistic style and instead painting the expression of what he felt inside. 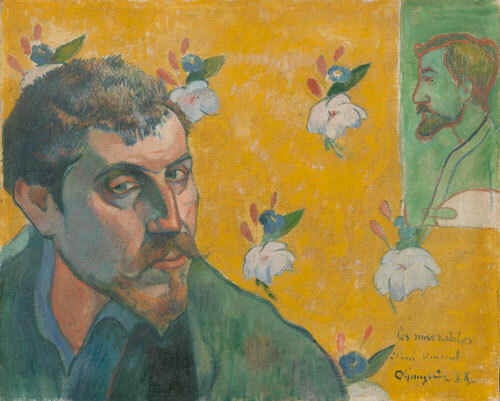 Gauguin self portrait – Autoportrait avec portrait de Bernard, ‘Les Misérables,’ 1887. Source: Wikimedia Commons. In October 1888 Gauguin traveled to the South of France, where he had a tumultuous friendship with fellow post-Impressionist artist Vincent van Gogh. Van Gogh’s brother Theo was an art dealer who represented Gauguin. Over time van Gogh convinced Gauguin to join him at his yellow house in Arles to start an artist’s colony. There, the artists painted side-by-side and frequently quarreled regarding the best ways to paint. Towards the end of their time together Gauguin and van Gogh had a heated argument, and van Gogh produced a razor blade to threaten Gauguin. Later that evening, van Gogh’s mental illness became more evident as he cut off his own ear. Gauguin left the artist’s colony in haste, never to see van Gogh again. They did, however, continue to correspond for the next few years. After Theo van Gogh passed away, Gauguin found himself financially destitute and without support for his work. In 1891 he set sail for Tahiti in hopes of finding new inspiration and parting ways with the conventional French way of life. Living in a hut in a small village provided him with the scenery he needed. The colors of the South Pacific were like none he’d ever seen, and his paintings reflected the lush surroundings of his new home. 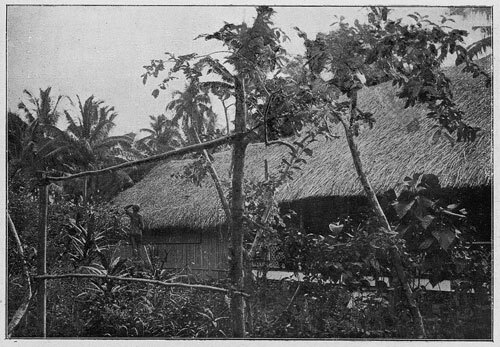 He had long dreamed of the fantasy of island culture and was drawn to his ideal of a “primitive” lifestyle, however his life with the local natives can be viewed as unsavory. He married a 13 year-old native not long after he arrived, impregnating her and also infecting her with syphilis. While his behavior and ethics were questionable, his work in Tahiti proved extremely influential. In Tahiti Gauguin created some of his most outstanding works, including Fatata te Miti (By the Sea), Ia Orana Maria (Hail Mary) and other Symbolist portrayals of the island lifestyle. Prior to his Tahitian travels, Gauguin said he hoped to someday find a tropical paradise where he could “live on fish and fruit.” For Gauguin, Tahiti was that paradise. In the artist’s journals, we find references to the island foods he ate while painting his Tahitian masterpieces. Fish appears repeatedly, and Gauguin would sometimes accompany natives on their fishing expeditions. Tahiti was a French colony at the time; because of this, some of the island fare had a French influence. In 1900 Gauguin hosted a banquet in Tahiti and created a series of illustrated menus for it, which were recently sold at various art auctions. The drawings feature menus that appear to combine both French and Tahitian fare. Among the main courses are wild pig cooked island style, chicken in a “sauce coco,” and roast beef. Of course there was wine and each meal was finished with dessert. Normal daily fare was not quite as extravagant. Gauguin’s day-to-day journals describe simple meals of vegetables, fish and fruit. When he learned that money was not as useful on these remote islands, he began to enjoy the foods that were readily available. In his journals he describes a wedding he attended in which a luxurious feast included roasted pigs, fish, banana, guava and taro – no fancy pastries or complicated side dishes, just simple fare. Gauguin remains one of the most influential artists of all time, and his paintings from Tahiti are perhaps his most beloved. An 1892 portrait of two Tahitian girls titled Nafea Faa Ipoipo recently sold for close to $300 million, one of the highest prices paid for a single piece of art. His colorful work is a reflection of his existence—a life of rebellion, escape and adventure. 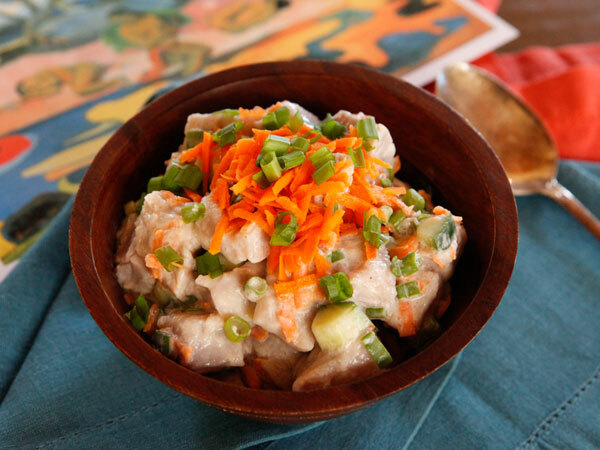 This traditional Tahitian fish dish, E’ia Ota (Tahitian name) or Poisson Cru (French name), is the sort of fare Gauguin might have eaten while living and painting on the islands. Fish was always in abundance, as were coconuts and fresh vegetables. The basic idea is to combine marinated fresh fish, half-cooked by lime juice, with coconut milk and vegetables. Similar to ceviche or Hawaiian poke, the coconut milk creates a creamy sauce and gives this dish a uniquely Tahitian personality. Only use the freshest, sushi-grade fish here. Serve on a fresh banana leaf or a bed of coconut rice, or at the very least a colorful plate in honor of Gauguin’s stunning use of color. While enjoying this dish, perhaps with a glass of French wine, imagine standing alongside Gauguin as he conjured magic on his canvas. Dice the fish into 3/4 inch pieces, then cover with cold water and 2 tbsp salt (add a few ice cubes if the water is not chilled). Let the fish sit for 20 minutes. Meanwhile, squeeze your limes to juice them. Drain the fish and pat it dry. Submerge the fish in fresh lime juice; you will need between 3/4 cup and 1 cup to cover. Let the fish marinate, stirring occasionally, for 15-30 minutes. While fish is marinating, prepare your vegetables. You may use any or all of the vegetables listed above; reserve a little of each on the side for garnish. Marinate the fish until the edges are opaque and the center of each piece is still pink. Drain the lime juice, then return the fish to the bowl. Stir in the fresh vegetables and coconut milk. Season with salt and pepper to taste. Allow the mixture to marinate in the refrigerator for 15-30 minutes. Serve cold garnished with fresh vegetables. May be enjoyed over coconut rice for a more filling entrée. Bolton, Linda. Post-Impressionists. Chicago, Illinois: Heinemann Library, 2003. Print. Cobblestone Films. The Post-Impressionists: Vincent Van Gogh and Paul Gauguin. A&E Television Networks, 2003. Television. Cromwell Productions. The Post-Impressionists – Gauguin. Kultur Video, 2001. Gauguin, Paul and Miller, John. Noa Noa: The Tahiti Journal of Paul Gauguin. San Francisco: Chronicle, 1994. Print. Medakovich, Molly. “A Taste of the Unexpected: Paul Gauguin’s Illustrated Menus.” Denver Art Museum. N.p., 18 Nov. 2013. Web, 29 May 2015. Reyburn, Scott and Carvajal, Doreen. 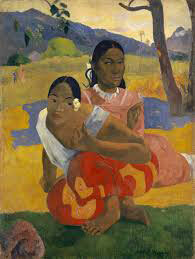 Gauguin Painting Is Said to Fetch $300 Million. NY Times, 5 Feb. 2015. Web, 29 May 2015. Sweetman, David. Paul Gauguin: A Life. New York: Simon & Schuster, 1995. Print.